The family run Almorah Hotel sits in an elevated position with views over the town and harbour of St Helier in Jersey. The Almorah Hotel in Jersey was built around 1841 and the 2 star hotel has an International reputation with the friendly reception able to cater for your every need. Bedrooms at the Almorah Hotel enjoy stunning views and all are en-suite and some even have a balcony. 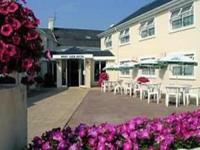 The charming 4 star Greenhill's Country Hotel stands within award-winning gardens in the heart of St Peter, Jersey. The 17th century house retains the character and original architectural features. There are 31 comfortable en-suite bedrooms, all are fully equipped, traditionally styled and well furnished. The restaurant offers superb cuisine using only the finest quality local produce. Conveniently located just 10 minutes walk from the centre of St Helier. The Savoy Hotel was once a grand town house and is now a luxury 4 star boutique hotel. The family-run hotel has been completely refurbished and provides beautiful bedrooms including balcony rooms, honeymoon suite and family rooms with adjoining rooms.